Having taken our sights, graphed them to estimate Hs, and applied corrections to determine Ho, we are now ready to calculate the latitude of my position when I took the sights. Since Ho is the observed height of the sun above the horizon, you might be wondering if Ho is the latitude value. No, it's not that simple, but almost. 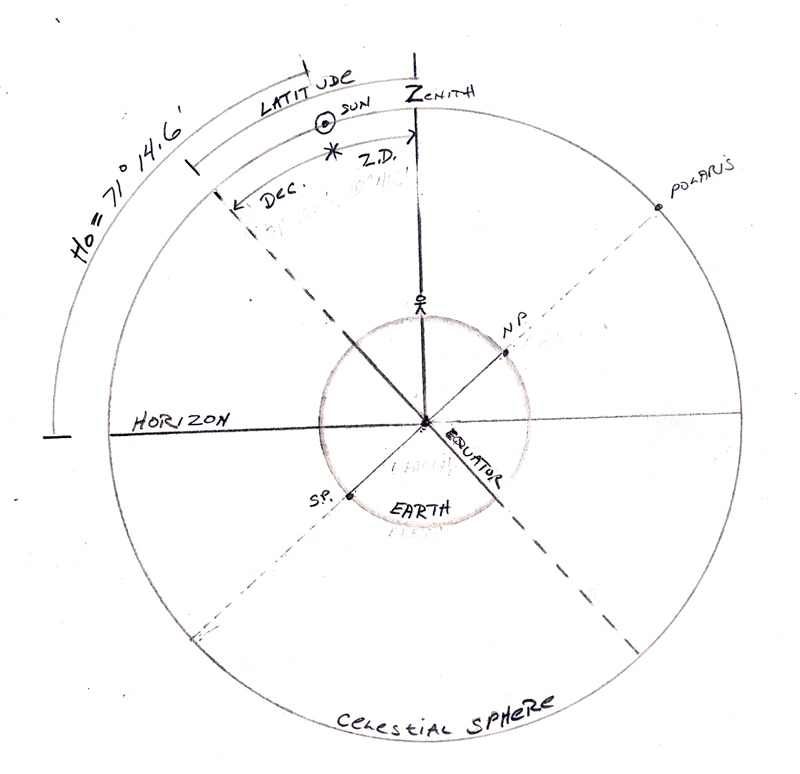 Here is a diagram that explains the simple relationship between Ho and Latitude. Let's take this diagram step by step. First, the inside circle represents the Earth. The outside circle represents the Celestial Sphere. Forget Copernicus and all that 'Earth rotating around the Sun' nonsense. Copernicus was clearly wrong. The Earth is at the center of the universe, and the Sun, Moon, stars, and planets all rotate around the earth, on the surface of the Celestial Sphere. At the top of the Earth, you can see me with my sextant, taking my sights. Study these three lines until they make sense to you, before continuing. They're pretty simple, but if you gloss over these three lines without really taking them in, the rest of this explanation will make no sense to you. Got it? Okay, my Latitude is the angle between my Zenith line, and the equator. This is the angle we are trying to find. Latitude = Dec + Z.D. Z.D. is the Zenith Distance of the Sun -- the angle between the Sun and my Zenith. Since the Zenith and Horizon lines are at a right angle, it's pretty obvious that you can calculate the zenith distance by subtracting Ho from 90°. Get it? Again, stop and study the diagram until this makes sense. If you just skip over this part, you won't really understand what's going on. It's easy, but you must stop a second to understand it. 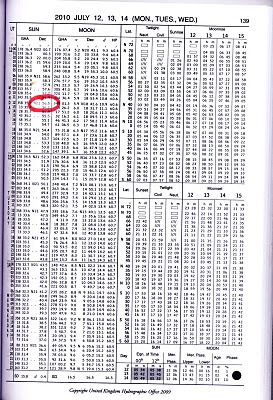 Dec. is the Declination of the Sun -- the height of the Sun above the Equator at solar noon on 12 Jul 2010. 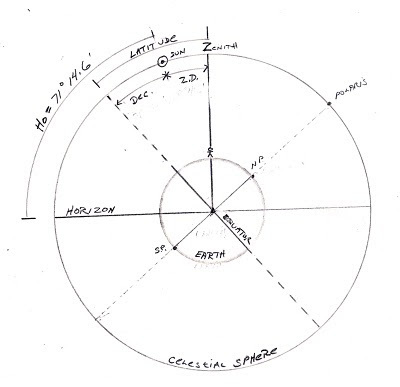 Note the difference between Ho and Declination: Ho is the height of the Sun above the horizon, and Dec is the height of the Sun above the equator. 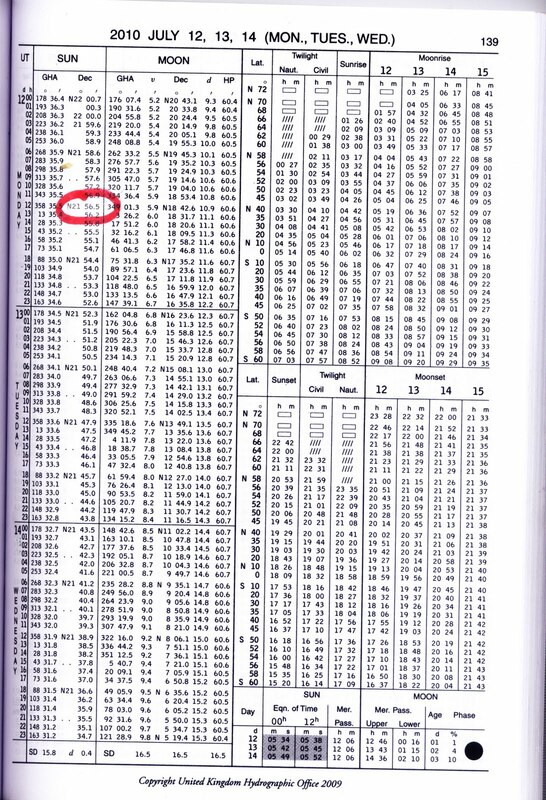 How do we know what the Sun's declination was at noon on 12 Jul 2010? We look it up in the Nautical Almanac. Actually, I circled the wrong entry. It's an easy mistake to make, so it's helpful that I made it (again!). We don't want the declination of the Sun when it was solar noon in Greenwich (12:00 GMT), we want it when it was solar noon at my location, roughly 17:00 GMT. So, we are almost there. So that's was my Latitude, according to my sextant sights. If you've followed along, and studied the diagram above just a bit, it should make sense to you. And note that the only math we've done is some simple addition and subtraction. No rocket science, and hopefully, no mystery. Next time we tackle the slightly more difficult problem of Longitude. DeeP: I guess you understood it? Cool! It's pretty simple, right? Ok John, I figure your just near where Ocean Ave turns into Hartshorne Drive. But where did you park the car? is that a restaurant carpark? What is that just up the road? Maybe Tollbooths? This is assuming you walked to the edge of the water to take your reading? I am also assuming this is the only place at 40.40 that you can see the horizon.